If you have ordered a pasta dish in Rome, chances are you have tasted Pecorino Romano. While outside of Italy it is more common to find Parmigiano Reggiano, parmesan cheese, as an accompaniment to Italian food, in Rome this sharp, savory, aged cheese is a key ingredient, adding the unmistakable salty hit to traditional dishes such as Carbonara, Amatriciana, and Cacio e Pepe. A staple, much-loved, local product it should be on your must-try list when visiting Rome. Derived from the Italian word for sheep (pecora), pecorino simply means any cheese made from sheep, or ewe’s, milk. The variety named Pecorino Romano is a hard sheep cheese which has been aged for at least 8 months, allowing the distinctive flavors to develop. Usually covered with a black-coated exterior, it has a brittle, crumbly, texture making it perfect for grating. The sharp, salty taste of pecorino helps not only to season a dish but also adds an extra flavor dimension, while the creamy texture means it will help to thicken sauces when combined with starchy pasta water. The history of Pecorino Romano dates back over 2000 years when the ancient Romans produced sheep milk cheese across central Italy. As an aged cheese, Pecorino Romano can be stored for a long time without going bad which, along with its calorie content, made it the ideal addition to the rations that the Roman Legionaries received as they marched through the empire. Before the unification of Italy in 1861, food in Italy was strictly regional as products and ingredients were made, sold, and utilized in their place of origin. This meant that, as the region of Lazio concentrated predominantly on the production of sheep (not cow) cheese, Pecorino Romano earned a fundamental place in the cuisine of its capital, Rome. After the late 19th century, the commercial opportunities afforded by unification saw the production of Pecorino Romano spread to the farmlands of Tuscany and Sardinia. Nowadays over 90% of the production takes place in Sardinia and authentic Pecorino Romano (which by law can only be produced in Sardinia, Lazio, and the Grosseto province in southern Tuscany) has earned PDO (Protected Designation of Origin) status under EU law. The production method of the cheese has remained the same throughout the centuries and still today the wheels are salted by hand to build up the unique and intense flavor. Pecorino Romano is a core feature of Roman cooking and appears regularly on menus, especially combined with Rome’s other cornerstone ingredient, guanciale (cured pork jowl). The dish which truly celebrates Rome’s favorite cheese is Cacio e Pepe, a simple yet exquisite pasta dish featuring just grated pecorino cheese and cracked black pepper which are combined and swirled with pasta water to create a creamy, satisfying sauce with a peppery kick. Although commonly used for cooking, Pecorino Romano may also be served by itself as part of a cheese plate and is a wonderful partner to sweeter elements such as honey, pears or grapes. 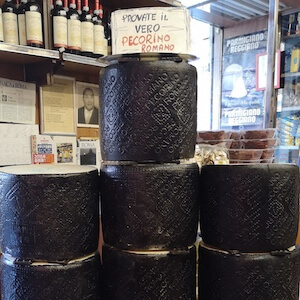 Taste authentic Pecorino Romano and savor the Roman dishes it plays such an important part in on our 4 Roman Pastas Tour and read our blog to discover the best places to buy cheese in Rome. Find out more about Pecorino Romano, one of the most important ingredients in Roman cooking. Discover what it is, how it is made and how to eat it in Rome.